Noah did this; he did all that God commanded him. As you may have figured out I think highly of D.L. Moody. Well, I'll tell you why. Simply because God used this man with only an 8th grade education to change the world for the better. Thousands have come to the Lord through his ministry and the fruit has remained much after his passing. Some of you have heard of R.A. Torrey, an equally anointed man who worked closely with Moody and knew him well. He gave a sermon illustrating the seven reasons for Moody's great anointing and success for the Lord and I wanted to share these with you. 1. 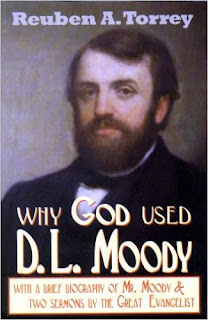 Moody was a fully surrendered man, he held nothing back from the Lord (...they loved not their lives unto the death. -- Revelation 12:11). 2. He was a man of much prayer (Pray without ceasing. -- 1 Thes. 5:17). 3. He was a deep and practical student of the Bible (Study to shew thyself approved unto God... -- 2 Timothy 2:15). 4. He was a humble man (Be not wise in your own conceits... -- Romans 12:16). 5. He was not a lover of money (For the love of money is the root of all evil... -- 1 Timothy 6:10). 6. He had a consuming passion for the salvation of the lost (Go ye into all the world, and preach the gospel to every creature. 7. And he was endued with Power from on High (... until ye be endued with power from on high. -- Luke 24:49). If we want to bear much lasting fruit for the Lord, I think this is a surefire way to go about it. I know my heart is convicted, how about yours? Let's strive to look at these areas of our lives and ask the Lord to empower us to make good changes! Dear Lord, we thank You for the great men and women that have come before us. We pray that we would learn from their examples that they have showed us. In The Name of Jesus, Amen.